Add drama to your eyes with tinting and threading. At unique threading, we use the very latest techniques in high lighting. We will enhance one of your most unique facial characteristics to give you a beautiful and sophisticated look. Enhance, your brow color to add fullness and visibility. 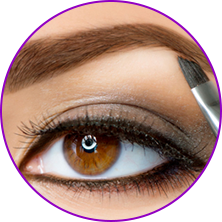 Lift your eyes with brow tinting. Henna is a miraculous plant that has been used for health and beauty treatments for thousands of years, including body adornment. The leaves of the henna plant are dried and crushed into a fine powder, then made into a creamy paste. This paste is then applied to the skin, which stains the top layer of skin only. And it works on all skin types and colors. Although it may look dark green when applied, the paste will flake off and reveal an orange or brown stain. The color will vary somewhat based on skin tone and placement on the body. Lighter skin tones will show a dark orange color and darker skin tones will see a light orange impression. 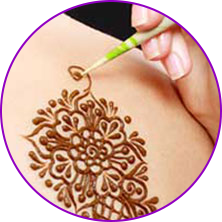 Your henna body art will last for approximately 7-10 days depending on various factors.